WASHINGTON — The White House refused Thursday to say whether it secretly fed intelligence reports to a top Republican lawmaker, fueling concerns about political interference in the investigation into possible coordination between Russia and the 2016 Trump campaign. Fending off the growing criticism, the administration invited lawmakers from both parties to view classified material it said relates to surveillance of the president’s associates. The invitation came as The New York Times reported that two White House officials — including an aide whose job was recently saved by President Donald Trump — secretly helped House intelligence committee chairman Devin Nunes examine intelligence information last week. Nunes is leading one of three investigations into Russia’s attempt to influence the campaign and Trump associates’ possible involvement. Late Thursday, an attorney for Michael Flynn, Trump’s ex-national security adviser, said Flynn is in discussions with the House and Senate intelligence committees about speaking to them in exchange for immunity. The talks are preliminary, and no official offers have been made. “General Flynn certainly has a story to tell, and he very much wants to tell it, should the circumstances permit,” Flynn’s attorney, Robert Kelner, said in a statement. Other Trump associates have volunteered to speak with investigators, but have not publicly raised the issue of immunity. Flynn, a member of the Trump campaign and transition, was fired as national security adviser after it was publicly disclosed that he misled the vice president about a conversation he had with the Russian ambassador to the U.S. Flynn’s ties to Russia have been scrutinized by the FBI and are under investigation by the House and Senate intelligence committees. The House panel’s work has been deeply, and perhaps irreparably, undermined by Nunes’ apparent coordination with the White House. He told reporters last week that he had seen troubling information about the improper distribution of Trump associates’ intercepted communications, and he briefed the president on the material, all before informing Rep. Adam Schiff, the committee’s top Democrat. “The White House has a lot of questions to answer,” he declared. Instead, the White House continued to sidestep queries about its role in showing Nunes classified information that appears to have included transcripts of foreign officials discussing Trump’s transition to the presidency, according to current and former U.S. officials. Intelligence agencies routinely monitor the communications of foreign officials living in the U.S., though the identities of Americans swept up in that collection is to be protected. In Russia, President Vladimir Putin said there was nothing to the allegations of election meddling. Did Russia interfere in the U.S. campaign, he was asked at a forum in the northern Russian city of Arkhangelsk? Injecting a bit of humor, Putin answered by quoting George H.W. Bush from the 1992 U.S. presidential campaign. “Read my lips: No,” he said, pronouncing the last word in English for emphasis. In Washington early last week, White House officials privately encouraged reporters to look into whether information about Trump associates had been improperly revealed in the intelligence gathering process. Days later, Nunes announced that he had evidence, via an unnamed source, showing that Trump and his aides’ communications had been collected through legal means but then “widely disseminated” throughout government agencies. He said the collections were not related to the Russia investigation. 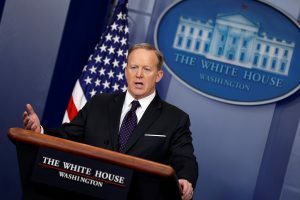 Trump spokesman Sean Spicer said Thursday the material the White House wants the House and Senate intelligence leaders to view was discovered by the National Security Council through the course of regular business. He would not say whether it was the same material Nunes had already seen. A congressional aide said Schiff did not receive the White House letter until after Spicer announced it from the White House briefing room. Spicer had previously dismissed the notion that the White House had funneled information to Nunes, saying the idea that the congressman would come and brief Trump on material the president’s team already had “doesn’t pass the smell test.” The White House quickly embraced Nunes’ revelations, saying they vindicated Trump’s explosive and unverified claim that President Barack Obama wiretapped his New York skyscraper. Nunes has said the information he received did not support that allegation, which has also been disputed by Obama and top intelligence officials. The Times reported that Ezra Cohen-Watnick, the senior director for intelligence at the White House National Security Council, and Michael Ellis, a White House lawyer who previously worked on the House intelligence committee, played roles in helping Nunes view the materials. Sean Spicer says the material the White House wants House and Senate intelligence leaders to view was discovered by the National Security Council through the course of regular business. Cohen-Watnick is among about a dozen White House officials who would have access to the types of classified information Nunes says he viewed, according to current and former U.S. officials. He’s become a controversial figure in intelligence circles, but Trump decided to keep him on over the objections of the CIA and National Security Adviser H.R. McMaster, according to the officials. They spoke only on condition of anonymity because they were not authorized to comment publicly by name. Cohen-Watnick and Nunes both served on the Trump transition team. Nunes has repeatedly sidestepped questions about who provided him the intelligence reports, though he pointedly has not denied that his sources were in the White House. House Speaker Paul Ryan, in an interview with “CBS This Morning” that aired Thursday, said Nunes told him a “whistleblower-type person” provided the information. A spokesman for Ryan later said the speaker was not aware of Nunes’ source and continues to have “full confidence” in the congressman’s ability to run the Russia investigation. Left: White House Press Secretary Sean Spicer holds the daily press briefing Mar. 29 at the White House in Washington, U.S. Photo by REUTERS/Jonathan Ernst.